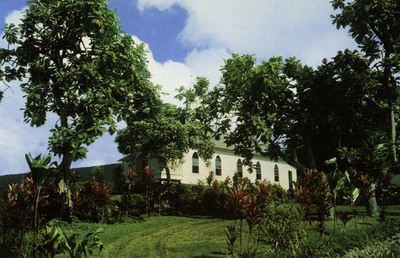 "Hawaii – St. Benedict's Catholic Church"
St. Benedict's Catholic Church Honaunau Kona, known as "The Old Paitned Church" because of murals and frescoes. One color postcard with a divided back. The postcard was published by Modern Camera Center in Hilo, Hawaii and printed by Dexter Press in West Nyack, New York.